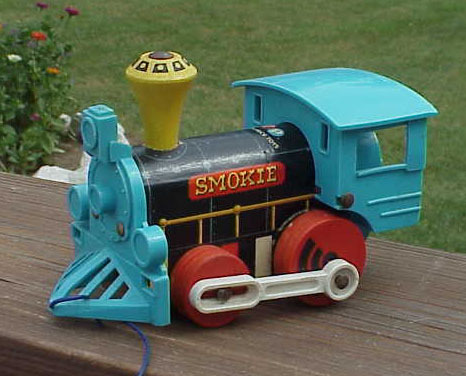 Description: The Smokie Engine is the second engine in a series of small wooden train engines that were made by Fisher-Price from 1959 to 1987. The engine has movable pistons and it makes a "chug-chug" sound when pulled. All of the engines in the "series" have the same action and sound, they are just colored differently (see "Other Information" below for other engines). FPT79 - Wooden train engine with a rounded boiler that has black paper lithographs on the sides marked "Smokey" in red and yellow on the sides. The engine has a blue plastic front grill and cowcatcher, a blue plastic cab with a roof, a yellow wooden smoke stack, and 4 red wooden wheels with white plastic pistons attached. When pulled, the pistons move and the engine makes a "chug-chug" sound. Measures 6-1/4" long, 4-1/4" high, 3-1/4" wide. Also see 1959's #642 Dinky Engine.